The federal Labor Party announced this week that, if elected, it will restore funding to Environmental Defenders Offices (EDOs) across Australia, in a package worth $14 million over four years. These organisations ensure that ordinary Australians have proper access to the law. We know that big corporations have deep pockets and they’re able to employ expensive legal teams but ordinary Australians – farmers, indigenous communities, ordinary citizens – should have just the same access to the law as anybody with the most expensive lawyers in the country. The first EDO was established in New South Wales in 1985, following the passage of a suite of environmental laws in the late 1970s covering heritage protection, environmental planning approvals, and establishing the Land and Environment Court. With growing public interest in planning and development, including the celebrated Green Bans movement, those laws introduced new requirements for environmental impact assessment, heritage protection and public participation. They also gave everyone the right to take legal action by bringing environmental matters to court. Even the best legislation is of little value, however, if people don’t have the means to make use of it. That is where the EDO comes in. In 1981, shortly after the opening of the new Land and Environment Court, a group of lawyers began working to establish an organisation to empower the community to make use of these new laws to protect the environment. After four years of planning and fundraising, the NSW EDO opened with a staff of one: solicitor Judith Preston. The idea spread. EDOs were set up in Victoria and Queensland in the early 1990s, and eventually established in all eight states and territories, with an additional office in North Queensland. The various EDOs have always remained separate, each managed by an independent board, although since 1996 they have shared advice and support through a national network. Despite their shoestring budgets, EDO lawyers have proved effective, developing impressive programs of litigation and legal education. With grants from groups such as the Myer Foundation and, later, recurrent funding from state and federal governments, EDOs were a well established part of the Australian legal landscape by the early 2000s. NSW, Queensland and Victoria were particularly effective in securing funding, each boasting dozens of staff at their peak in the mid-2000s. Thanks to large grants from the NSW Public Purpose Fund and the MacArthur Foundation, the NSW EDO’s staff included not just lawyers but also environmental scientists, an Indigenous solicitor working specifically on Indigenous matters, and a team working from a new regional office in Lismore. Despite salaries well below market rates, EDO lawyers have consistently punched above their weight. Landmark wins have included defending the WA tourist town of Margaret River against coal mining, and helping the Goolarabooloo community challenge approvals for a liquefied natural gas hub at James Price Point, north of Broome. In 2015 the NSW EDO successfully overturned the approval of Adani’s Carmichael coal mine in central Queensland, although the federal government later reapproved it. With success, particularly against Adani, came criticism. After almost 20 years of bipartisan support, the Abbott government abruptly cut funding to EDOs in 2013 amid allegations of activist “lawfare”. Coalition governments in several states followed suit, prompting staff cuts, restructures, and an increase in fundraising efforts among the EDO network. EDO Victoria became Environmental Justice Australia, the Lismore office closed, and EDOs generally reduced the scale and scope of their work. While EDOs are best known for their litigation – running high-profile cases on issues such as climate change, conservation and alleged water theft in the Murray-Darling Basin – their work is much broader than this. All EDOs provide free legal education and advice, both via telephone and through community workshops and seminars, many in rural and remote areas. They publish plain-language explanations of a complex range of state and federal environmental laws, a vital resource used by government departments and universities as well as members of the public. EDOs also undertake law reform work, making submissions to parliamentary inquiries and giving expert evidence. Legal education, outreach, advice and, occasionally, public interest litigation, are essential for environmental justice and should be funded accordingly. The poll found stark differences between voting intentions and attitude to energy policy. with reducing the risk of blackouts. opted for reducing the risk of blackouts. gave top priority to cutting emissions. The Ipsos poll has Labor leading in two-party terms 52-48%. be followed by a question and answer session. Labor’s shadow cabinet will consider the ALP policy before the speech. internal meltdown that ended in the change of leadership. The ALP is committed to cutting emissions by 45% by 2030 off a 2005 baseline. Australia’s Commonwealth Coat of Arms depicts two iconic native animals – the kangaroo and the emu. Both are unquestionably fair dinkum Aussies, unique to this continent and having lived here for a very long time. A “very long time”, according to Australian legislation (the EPBC Act 1999), is any species having been present since before the year 1400. But in Western Australia, under the state’s Biodiversity Conservation Act 2016, no native animal is guaranteed protection. The Act includes a caveat whereby the relevant minister may determine that a native species is in fact, not. This week, WA’s environment minister Stephen Dawson did just that, declaring that from January 1, 2019, the dingo, Australia’s native canine, will no longer be classified as native fauna. The dingo does meet the federal government’s criterion, having lived in Australia as a wild canid for an estimated 5,000 years. But under the planned changes in WA, the dingo will lose its current listing as “unprotected fauna”, and will from next year be considered indistinguishable from either the common domestic dog or feral dogs. What is a species anyway? According to the biological species concept, a species is a group that has the ability to interbreed and produce viable, fertile offspring. Dingoes, dogs and other canids do interbreed (or “hybridise”), and indeed this is one of the key reasons why the pure dingo is listed as vulnerable by the International Union for the Conservation of Nature. But this ability to hybridise is also one of the main justifications cited by the WA government in its decision to revoke the dingo’s citizenship (the fact sheet has since been removed from the website, but can be accessed here). The rationale is that if dingoes and dogs are technically the same species, why should dingoes get special treatment? However, the biological species concept is problematic when applied to canids. If you lump dingoes and dogs together because they readily interbreed, then logically we must do the same for wolves, coyotes, jackals or other canids that can also interbreed (and have done for millenia). It’s hard to imagine anyone seriously suggesting that a grey wolf and a pug are the same species. This suggests that this criterion alone is insufficient to solve the conundrum. Indeed, there are at least 32 different species concepts, clearly illustrating the difficulty of defining a single rule by which all organisms should abide. Despite this, a recent paper that argues the biological species concept should be applied to dingoes, was cited as supporting evidence by the WA government. Adopting this narrow interpretation of taxonomy is perhaps somewhat premature. It ignores other investigations that provide evidence to the contrary. Given the contention around defining species, it seems unwise to determine the species status of dingoes independently of other, more comprehensive evidence and argument. All canids share similarities, but their differences are also many and marked. The dingo can be distinguished from other dogs in various ways: their appearance, anatomy, behaviour, their role in ecosystems, and their genetics (their evolutionary history and degree of relatedness to other species). Dingoes seem to be largely devoid of many of the signs of domestication. It is therefore reasonable for the dingo to be considered separately from wolves and domestic dogs, while also acknowledging that they all occupy the same broad species classification, Canis lupus. Having lived in Australia as free-living, wild populations for around 5,000 years almost exclusively under the forces of natural selection, and separately from any other dog lineage until European arrival, there is no notion of the dingo as a domestic animal gone feral. To classify dingoes as nothing more than “feral domestic dogs” expunges their unique, long and quintessentially wild history. Dingoes are not ecologically interchangeable with any other type of dog, either wild or domesticated. Australia’s dingo is a recognisable species. Labelling the dingo as a feral domestic dog changes their legal status and removes any current obligations for developing appropriate management plans. This demotion of status could lead to intensified lethal control. Indeed, control may even be legally mandated. In the absence of thylacines, mainland Tasmanian devils, and other apex predators, the ecological role that the dingo plays in the Australian landscape is vital. Dingoes help to control kangaroo and feral goat populations, and in some cases foxes and cats as well. Given WA’s remoteness, it remains one of the few bastions of pure dingoes, and as such it presents an opportunity to seek ways to protect them rather than pave the way for their removal. The WA government’s decision also sets a dangerous precedent for the management of dingoes, and indeed other contentious native wildlife, elsewhere in Australia. How we choose to classify plants and animals might sound like dry science. But it has genuine implications for policy, management and conservation. Our scientific naming systems are vital for helping to organise and understand the rich biological diversity with which we share the planet, but it is important to remember that these systems are informed not just by biology but also by our values. In this case, economic and political interests appear to have been favoured over wildlife preservation, and given Australia’s unenviable conservation record this is deeply concerning. As I predicted a year ago, 2017 was another vicious and bloody-minded year in Australian climate politics. Yet the political bickering belied the fact that it was actually a great year for green energy. Nowhere was that more in evidence than in South Australia, which got its big battery inside 100-day deadline, with the world’s biggest solar thermal plant set to begin construction this year. Elsewhere, Prime Minister Malcolm Turnbull talked up the prospects of the Snowy 2.0 hydro storage project. Yet the politics remain as rancorous as ever. The federal government unveiled its National Energy Guarantee in November, after Chief Scientist Alan Finkel’s Clean Energy Target proved too rich for some in the Coalition. Just before Christmas, the long-awaited climate policy review was released, and immediately branded as weak. Both issues are unresolved, and are set to loom large on the landscape this year. But what else is on the horizon? We should always expect the unexpected. But perhaps the most predictable “unexpected” event would be a heatwave, prompting one or more of our creaking coal-fired power stations to have a meltdown. Maybe the “Big Banana” (as Elon Musk’s battery has been branded) will step in again, as it already has. If fossil fuel power stations fail again, expect to see the culture war heat up again, with coal’s defenders using ever more twisting logic to defend their dear dinosaur technology. Barring the apocalypse, on March 17 South Australians will go to the polls. Will Premier Jay Weatherill be returned to power, to continue his long-running stoush with federal energy minister Josh Frydenberg? Will heatwaves and power outages help or hinder him? At the moment, polls have former senator Nick Xenophon as putative premier. My crystal ball is hazy on what this would mean for energy policy. In April there will be a meeting of the COAG Energy Council at which the NEG proposal will come under scrutiny. Expect it to be bloody. State governments have demanded more modelling, so they can compare the NEG to Finkel’s Clean Energy Target that Finkel suggested, and an emissions intensity scheme. Current SA treasurer Tom Koutsantonis has raised several concerns with the NEG, arguing that it doesn’t give a big enough boost to renewables, and would do nothing to break up the power of the big “gentailers”, who generate and sell electricity. “To proceed, the NEG would require unanimous support at COAG, so this policy is either years away, or won’t happen at all,” Koutsantonis said. Expect a long-running pitched battle if Weatherill and Koutsantonis are still about, and perhaps even if they’re not. In the May budget the Turnbull government is going to have to decide what to do about the Emissions Reduction Fund, the centrepiece of former prime minister Tony Abbott’s Direct Action policy, which replaced his predecessor Julia Gillard’s carbon price. The fund, which lets companies bid for public money to implement emissions-reduction projects, started at A$2.55bn, and there is about A$260 million left. Connected to these decisions are questions over whether and how the fund’s “safeguard mechanism”, which is supposed to stop the system being gamed, will be modified. Among the many criticisms levelled at the government’s 2017 climate policy review, released with little fanfare the week before Christmas, was the proposal to make the already flexible mechanism even more flexible, so as to “reduce the administrative and auditing costs” for businesses. The government’s climate review also says that in 2018 it will start the process of developing a long-term emissions-reduction strategy, to be finalised by 2020. It has promised to “consult widely” with businesses, the community, states and territories, and other G20 nations. Time will tell exactly how wide this consultation turns out to be, although anything would be better than the Trump Adminstration’s systematic removal of the term “climate change” from federal websites. The climate review suggests that the Turnbull government will push for more international carbon trading. An unlikely alliance has formed against the idea, consisting of those who view carbon credits as buck-passing, as well as Tony Abbott, who thinks Australian money “shouldn’t be going offshore into dodgy carbon farms in Equatorial Guinea and Kazakhstan”. His stance has already been branded as nonsensical by the business lobby – who, it must be said, stand to benefit significantly from carbon trading. On the diplomatic front, the United Nations will hold a “2018 Talanoa dialogue” process, featuring a series of meetings in which major economies will come under pressure to upgrade their climate commitments to meet the Paris target. As Giles Parkinson notes, Australia had probably thought that they could get away with no climate target upgrades until around 2025. In October the Intergovernmental Panel on Climate Change will release a report on the impacts of global warming of 1.5℃ – the more ambitious of the Paris Agreement’s twin goals – and the emissions pathways we would need to follow to get there. Expect climate deniers to get their retaliation in first. The next UNFCCC Conference of the Parties (number 24 in a never-ending series) will be held in December in Katowice, in Poland’s coal heartland. So, prediction is very difficult, but most of us like to indulge. Reneweconomy asked Frydenberg, his opposite number Mark Butler, and the Greens’ climate spokesperson Adam Bandt what they thought was coming up. Frydenberg talked up “innovative projects” like this summer’s demand response trial and Snowy 2.0. Butler gloomily forecasted more policy chaos and renewables-blaming, while Bandt was sunnier, predicting that 2018 will be “the year of energy storage” as the economics for commercial and household batteries begin to stack up. Bandt also thinks the public debate will heat up as extreme weather hits, and the national security implications become (more) obvious. Well, it will be fun to watch whether the Minerals Council pulls its horns in under the threat of BHP pulling out. Early signs would suggest not. Will other mining companies defect? Will battery storage get a grip on the grid? Will Adani pull the plug on Carmichael under continuing pressure from campaigners? Well, here are some safe predictions. Donald Trump will continue being Donald Trump. Liberal and National backbenchers will put pressure on Turnbull to do what John Howard did when George W. Bush was in the Oval Office – namely, get into the United States’ slipstream and take advantage of the lowered ambition. There will be further stunning developments in energy storage, and the prices of solar and wind will continue to plummet. Meanwhile, Australia’s emissions will continue to rise, as will the atmosphere’s carbon dioxide concentrations. This time last year, Australia was getting over a media storm about renewables, energy policy and climate change. The media storm was caused by a physical storm: a mid-latitude cyclone that hit South Australia on September 29 and set in train a series of events that is still playing itself out. In one sense, the Finkel Review was a response to the government’s concerns about “energy security”. But it also managed to successfully respond to the way energy policy had become a political plaything, as exemplified by the attacks on South Australia. New research on the media coverage that framed the energy debate that has ensued over the past year reveals some interesting turning points in how Australia’s media report on climate change. 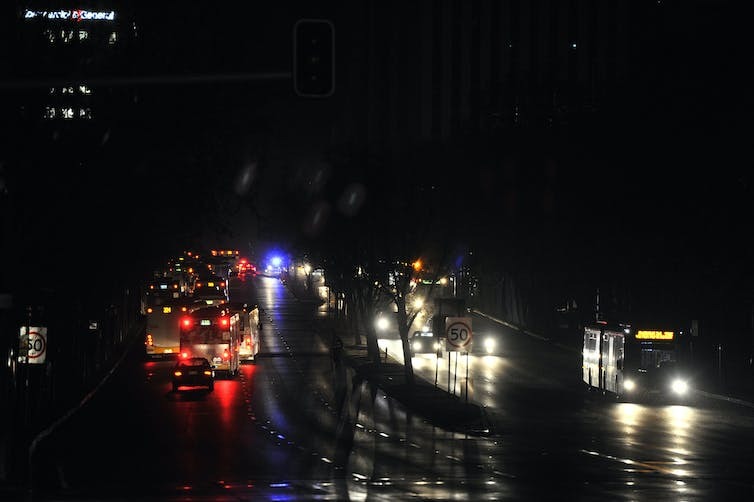 While extreme weather events are the best time to communicate climate change – the additional energy humans are adding to the climate is on full display – the South Australian event was used to attack renewables rather than the carbonisation of the atmosphere. Federal MPs hijacked people’s need to understand the reason for the blackout “by simply swapping climate change with renewables”. However, the research shows that, ironically, MPs who invited us to “look over here” at the recalcitrant renewables – and not at climate-change-fuelled super-storms – managed to make climate change reappear. The study searched for all Australian newspaper articles that mentioned either a storm or a cyclone in relation to South Australia that had been published in the ten days either side of the event. This returned 591 articles. Most of the relevant articles were published after the storm, with warnings of the cyclone beforehand. 51% of articles were about the power outage and 38% were about renewables, but 12% of all articles connected these two. 20% of articles focused on the event being politicised by politicians. 9% of articles raised climate change as a force in the event and the blackouts. 10% of articles blamed the blackouts on renewables. Of all of the articles linking power outages to renewables 46% were published in News Corp and 14% were published in Fairfax. Narratives that typically substituted any possibility of a link to climate change, included the “unstoppable power of nature” (18%), failure of planning (5.25%), and triumph of humanity (5.6%). Only 9% of articles discussed climate change. Of these, 73% presented climate change positively, 21% were neutral, and 6% negative. But, for the most part, climate change was linked to the conversation around renewables: there was a 74% overlap. 36% of articles discussing climate change linked it to the intensification of extreme weather events. There was also a strong correlation between the positive and negative discussion of climate change and the ownership of newspapers. The starkest contrast was between the two largest Australian newspaper groups. 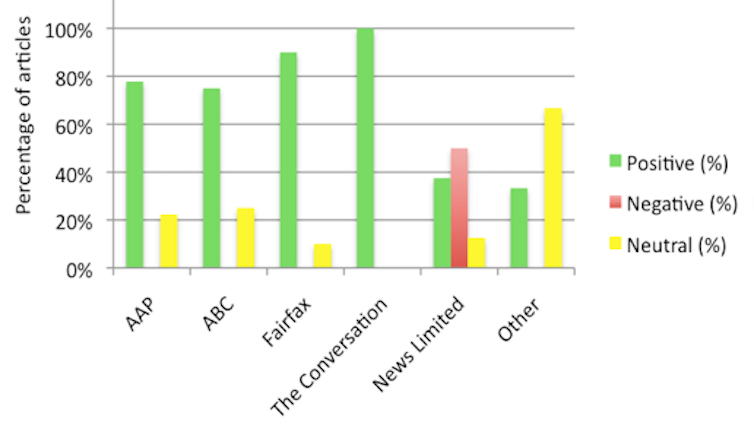 Of all the sampled articles that mentioned climate change, News Corp was the only group to has a negative stance on climate change (at 50% of articles), but still with 38% positive. Fairfax was 90% positive and 10% neutral about climate change. Positive/negative stance of articles covering climate change by percentage. Given that more than half of all articles discussed power outages, the cyclone in a sense competed with renewables as a news item. Both have a bearing on power supply and distribution. But, ironically, it was renewables that put climate change on the news agenda – not the cyclone. Of the articles discussing renewables, 67% were positive about renewables with only 33% “negative” and blaming them for the power outages. In this way, the negative frame that politicians put on renewable energy may have sparked debate that was used to highlight the positives of renewable energy and what’s driving it: reduced emissions. But perhaps the most interesting finding is the backlash by news media against MPs’ attempts to politicise renewables. 19.63% of all articles in the sample had called out (mainly federal) MPs for politicising the issue and using South Australians’ misfortune as a political opportunity. This in turn was related to the fact that, of all the articles discussing renewables, 67% were positive about renewables with only 33% supporting MPs’ attempts to blame them for the power outages. In this way, while many MPs had put renewables on the agenda by denigrating them, most journalists were eager to cover the positive side of renewables. Nevertheless, the way MPs sought to dominate the news agenda over the storm did take away from discussion of climate science and the causes of the cyclone. Less than 4% of articles referred to extreme weather intensifying as a trend. This is problematic. It means that, with a few exceptions, Australia’s climate scientists are not able to engage with the public in key periods after extreme weather events. When MPs, with co-ordinated media campaigns, enjoy monopoly holdings in the attention economy of news cycles, science communication and the stories of climate that could be told are often relegated to other media. As atmospheric carbon dioxide concentrations rise, so too does the number of books telling us what the consequences are, and what we can do. Two more have been released in the past few weeks – Anna Krien’s brilliant Quarterly Essay The Long Goodbye: Coal, Coral and Australia’s Climate Deadlock, and the worthy Climate Wars by Labor’s shadow environment minister Mark Butler. Both deserve a wide audience. Krien, author of Into the Woods: The Battle for Tasmania’s Forests has a sharp eye for the right anecdote and a brilliant turn of phrase. Her reportage can be spoken of in the same breath as Elizabeth Kolbert’s seminal Field Notes from a Catastrophe. She has read extensively (I for one was not familiar with the Myxocene – the age of slime) and in researching her latest essay has clocked up thousands of miles as she dives on the Great Barrier Reef and travels inland to areas that will be affected by the proposed coal mine developments in the Galilee Basin. Krien offers valuable insights into issues such as coal firm Adani’s negotiations with traditional owners, the battles over coal seam gas, and Port Augusta’s rocky transition from coal to – possibly – renewables. She talks to “ordinary” people, weaving their perspectives into the story while not losing sight of the climate deadlock in her title – the ongoing fight within the Liberal and National parties over climate and energy policy. In one of many telling phrases she writes of the “Stockholm syndrome built on donations, royalties, taxes and threats” that bedevils Australian politics, pointing out that the fate that befell Kevin Rudd still looms large in the collective political memory. In the end, she returns to the Great Barrier Reef, and her final paragraphs pack an emotional punch that will stay with the reader for a long time. My only quibble with Krien’s fastidious reporting is that, unlike previous Quarterly Essays, there are no footnotes. But maybe that’s only really an issue for nerds like me. This is Quarterly Essay 66. Number 33 was Guy Pearse’s equally alarming Quarry Vision. In years to come, perhaps Quarterly Essay 99 might explain how we continued not to take action, as the consequences of climate change piled ever higher around us. Or how – alongside unexpected technological breakthroughs – we began finally to race against our nemesis, our own hubris. Time will tell. Mark Butler is aiming to do something else besides just telling us about climate politics: as a shadow minister he is setting out Labor’s stall for the next federal election, whenever that might be. Butler was climate minister in Rudd’s second, brief, government. In 2015-16 he undertook extensive consultations with business, community groups, academics and other “stakeholders” (surely everyone in the world is a stakeholder when it comes to the climate?). His book is essentially an extended advert for that process and its outcomes. Butler’s prose is solid, and occasionally stolid, as he throws fact after report after statistic at the reader. However, he generally seeks to strike a constructive balance between “problem” and “solution”. There are only a few short chapters on the climate policy mess, with the bulk of the book concentrating on what a future Labor government proposes to do about it. Inevitably, Butler is more critical of his political rivals, the Liberals and the Greens, than of his own party. You wouldn’t know from reading this book that it was Paul Keating’s Labor government who first began to use economic modelling to argue against emissions reductions, or that it was a Labor government who, in 1995, refused to institute a small carbon tax that would fund renewable energy. Butler is also, oddly, flat-out wrong when he writes that former Labor minister Graham Richardson persuaded Prime Minister Bob Hawke to agree a 20% emissions reduction target before the 1990 federal election. It was actually his colleague Ros Kelly, in October 1990, and the “commitment” was carefully hedged. These historical details matter, because we need to be able to hold politicians (and even ex-politicians) to account over their climate pledges. But many readers will nevertheless be more interested in what Butler says a Labor government will do, rather than what previous Labor governments didn’t. Butler obliges, giving us chapters on “Labor’s clean power plan”, “Manufacturing and mining in a low-carbon world”, and “Low-carbon communities”. Occasionally he raises thorny problems (refugees, the coal industry) without really grappling with them. Given the ugly history around these issues (and the political Stockholm Syndrome identified by Krien), this is perhaps unsurprising. Curiously, both books make a similar omission: they contain very little on the failures of policymakers and social movement organisations in the period from 2006 to 2012. In 2015, at the Labor Party’s national conference, I asked panellists – Butler was one – what had gone wrong during this time, which encompassed Kevin Rudd’s first prime ministership – in light of the fact that we had known about climate change since the late 1980s. The other panellists gave thoughtful, sometimes self-critical answers. Butler kept schtum. Yet the question is worth asking if we are to avoid history repeating itself, this time as farce. We need smart people – and Krien and Butler are among them – to be asking how citizens can exert sustained pressure on existing governments and to build capacity to keep holding governments’ feet to the fire until they really and truly take climate policy seriously instead of just using it to score points and kill careers. Ultimately, anyone interested in the future of Australia – and the future of climate policy – should read both of these books carefully. While Krien’s has some immediate use, its greater function will be something we can pull out of a time capsule to explain to young people 20 years hence that we knew exactly what was coming and what we had to do. It will help them understand why we didn’t do it. Butler’s book will serve well over the next five years, as citizens try to hold a putative Labor government to its fine (if still inadequate) promises on the great moral challenge of our generation.